Most couples enjoy getting to wake up next to one another, but busy lives don't always allow it. Our experts have put together a bouquet that will help bridge the gap just a bit. 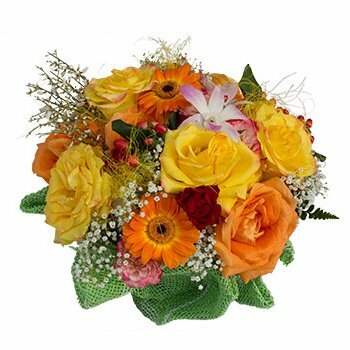 Your recipient will receive a bright bouquet full of yellow, classic red and orange Roses, and more. Welcome your love back home, say I Miss You, or have an untraditional Valentine's Day with Greet the Morning.